It is important as fitness professionals that we present a professional and competent image to our clients. A structured lesson plan can facilitate this process. Further, a well planned and thought out fitness lesson is part of the qualities of a good instructor. As such, it is of paramount importance and is a guide for you, the fitness professional, to follow. Example lesson plans can be found here. Part One (Warm-up): this should have some relevance to the main theme and should be a minimum of 10 minutes. Part Two (Main Theme): this is the main part and it should include any activities or exercises that will be covered and should be a minimum of 20 minutes. Part Three (Cool-down): this should have some relevance to the main theme and should be a minimum of 10 minutes. A detailed layout of the route or the area to be used should be routine. This will assist you and any assistants when organising and preparing the lesson. Prior to any physical training lesson the instructor must carry out a visual assessment of the area in which the lesson will take place. It is advisable under the Health and Safety at Work Act to make a written note of this. 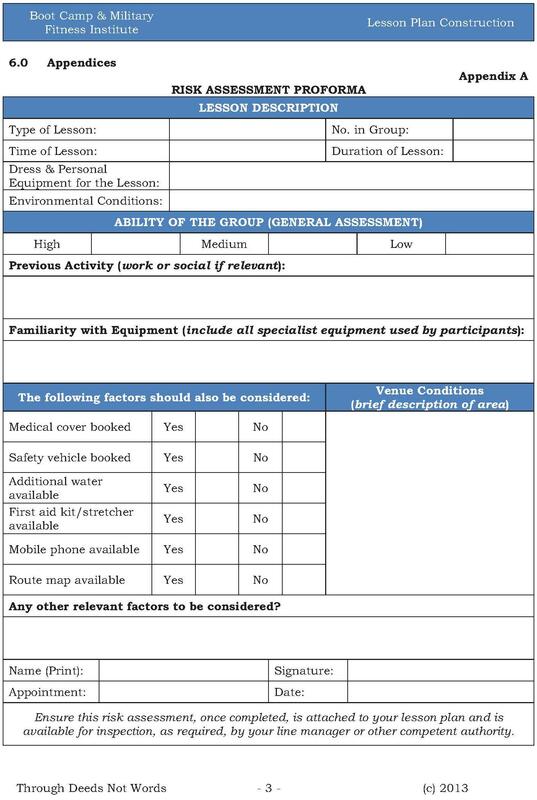 As there is no set guide to the way your personal assessment is achieved, the form below provides a guide to the layout and content of a Risk Assessment Proforma. For details on Risk Assessments conducted at the organisational level view: Organisational Risk Assessments.